When the autumn of 1980 arrived in Mid-Atlantic Championship Wrestling “Hossein the Arab,” the Iron Sheik, was riding high in the territory. 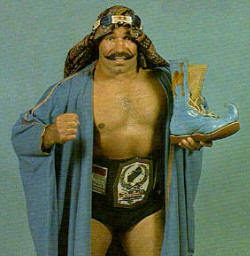 The Sheik was the reigning Mid-Atlantic Heavyweight Champion, and he also held the Canadian Heavyweight Championship. If holding all that hardware wasn’t enough, the Sheik was set to form a tag team that had the potential to shake up Jim Crockett Promotions in a very big way. Absent from the Mid-Atlantic area since early 1975, Ivan Koloff made his return to Jim Crockett Promotions in early October of 1980. And while the Russian Bear did team at times with his friend the Iron Sheik in the early days after his return, Koloff initially got embroiled in a feud with the masked Sweet Ebony Diamond. At that same time, the Sheik was in a heated battle with Ricky Steamboat over the Mid-Atlantic Title. In November, when the Sheik lost the Mid-Atlantic belt to Steamboat and Ivan’s feud with Ebony Diamond began to fizzle out, Koloff and the Sheik started to team more frequently. The result of that increased teaming was surprising, to say the least! Stunningly, issues between Koloff and the Sheik came out in the open as the holiday season of 1980 commenced, specifically during TV programming that was taped on November 26, 1980. On that World Wide Wrestling show when the two “friends” were being interviewed by announcer Rich Landrum after an easy victory over Special Delivery Jones and Jerry Caldwell, both the Sheik and Koloff were espousing the superiority of their respective home nations, Iran and Russia. When Caudle interviewed the two after the bout, he said, “Ivan, you and your partner, the Sheik right here, you guys are partners! Why are you all having a disagreement and a fuss in the ring?” The Sheik jumped in and was extolling his virtues and that of his home country, Iran, before Koloff could get a word in. Ivan then blurted out, “I think this interview was for both of us out here.” Koloff then went on to argue the superiority of the Russian athlete and their dominance in the Olympics. When the Sheik interrupted Koloff at this juncture, things started to get heated. The next week at the December 3, 1980 taping of the Mid-Atlantic Championship Wrestling television show there was a match between Koloff and Sweet Ebony Diamond. Ivan was still trying to “bury” the masked man with that same shovel he carried around with him, seeking revenge for Diamond previously running him out of the west coast in a Loser Leaves Town match. The Iron Sheik joined Bob Caudle and David Crockett on television commentary, and he told the fans that he didn’t like either Diamond or Koloff but admitted they both were tough wrestlers. After the Sheik smashed Koloff in the head again with the chair and attempted a third time, the Russian Bear got the steel chair away from the crazy Iranian. Caudle excitedly said, “Now Koloff has got it, and he conks the Sheik with the chair, and now across the back!” As the Sheik dove out of the ring, Koloff hit him again with the chair and then the two fought on the floor at ringside, with referee Sonny Fargo unable to restore order for quite some time! Koloff and the Sheik then began their “Battle of the Bullies” program in earnest in the territory’s arenas around Christmas-time, with a particularly brutal battle between the two bad guys occurring at County Hall in Charleston, South Carolina on December 26th. The two former friends then traveled several hundred miles north to Lynchburg, Virginia on December 28th to close out the wrestling year on an extremely bloody note. Koloff was true to his word, as the first half of the month of January in the new year of 1981 saw he and the Sheik go at it in matches of unparalleled violence. Fans in the Palmetto state of South Carolina saw these bruising battles up close and personal, particularly in the cities of Greenville and Sumter. In both of these towns, Koloff and the Sheik battled to wild double disqualification finishes in the first bouts, which led to Russian Chain match return bouts in both towns. The Russian Chain match was Koloff’s specialty match, and the Russian Bear prevailed in both of these bloody return matches, the second of which occurred in Sumter on January 15th. The Richmond match was another vicious encounter, with Koloff getting the dukes after a chaotic finish. The two protagonists continued to go at it hot and heavy for the rest of the month of January in spirited contests in the Charlotte Coliseum on January 18th, in Lynchburg, Virginia on January 23rd, at the Greensboro Coliseum on January 24th and at the Township Auditorium in Columbia, South Carolina on January 27th. Koloff dominated the results in these later January bouts, but they were all highly competitive, blistering hot affairs. February of 1981 marked the end of this brief Battle of the Bullies program between Ivan Koloff and the Iron Sheik. The last bout pitting the Sheik and Koloff took place on February 14, 1981, Valentine’s Day, but there was no love shared in the Spartanburg Memorial Auditorium that day! Koloff triumphed again in this final encounter, before both men went their separate ways. 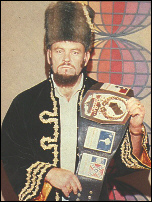 Ivan began teaming up with Ray Stevens, and the two set their sights on the NWA World Tag Team Titles held by Paul Jones and the Masked Superstar, winning the belts on March 1st and having a brief three week championship run. The Sheik segued to a feud with Blackjack Mulligan, that he came out on the short end of, and the Great Hossein Arab exited the Mid-Atlantic area in early May of 1981. While the rift between Koloff and the Sheik was brief and a mere footnote in the history of Mid-Atlantic Championship Wrestling, it was noteworthy in that it was one of booker George Scott’s last programs, and a very rare instance of Scott pitting a bad guy against a bad guy. Prior to Scott taking over the Jim Crockett Promotions “book” in 1973, Battle of the Bullies programs between wrestling heels was something that Jim Crockett Promotions fans expected periodically, with some very interesting short term pairings occurring as a result. In that sense, it was a throwback in time to see the hated Sheik and the hated Koloff go from friends to foes before our eyes! The Battle of the Bullies, version 1980-81, between the Iron Sheik and Ivan Koloff gave the Mid-Atlantic faithful a rare chance to cheer both wrestlers into beating the heck out of the other during and around the festive holiday season! It was “Season’s Beatings,” with out a doubt!